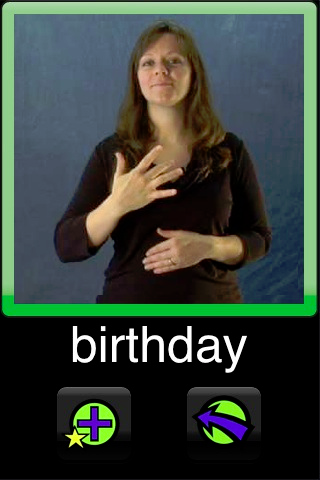 Baby sign language is very popular right now, and I want to jump on that bandwagon. My daughter Jordan is five months old, so I plan to start teaching her some basic sign language. I have a book and a DVD, but do I have time to deal with that? No. This Baby Sign ASL app is perfect. There are more than enough words here (don’t cheap out and get a free version- it is a waste of time). Each word is demonstrated through a clear video. You can add your favorites to a list and quiz yourself. You can search alphabetically or by categories. I spent about five minutes with the app today, and I have a few signs in mind (mommy, daddy, milk, and bath) that I plan to show Jordan tonight. While I was watching the videos, I couldn’t help thinking of Robert DeNiro’s character teaching his grandson signs in “Meet the Fockers”. Posted on January 15, 2012, in Apps, iPad, iTunes, Review. Bookmark the permalink. Leave a comment.